Wanna try raw octopus in Korea? Have you seen the movie “Old Boy” starring Choi Min Sik? There was an infamous scene where he was devouring a big live octopus. Well, raw octopus is a delicacy in Korea. It is sliced into bite-size pieces and dipped in gochujang (red pepper paste). I like raw fish (sashimi) but I haven’t had the guts to try “san nakchi” (raw octopus) and I don’t think I’ll ever try it. It reminds me of squirming worms. Yaiks! kaya nga never tried eh… kahit ano’ng pilit! Hello, I like finding good ideas about raw food worth reading for my researches, I found few great comments and suggestions already that will help me, thx. 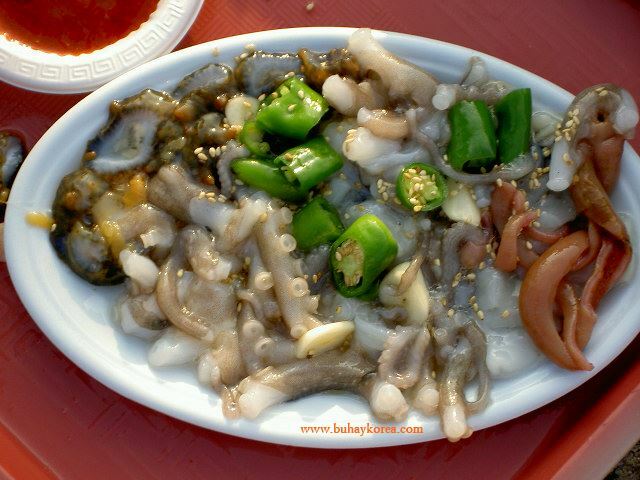 Raw Octopus or is a delicacy in Korea just as Chicken Feet (Adidas) and Kilawin are in Philippines. I’ve heard it taste sweet and spicy (because of the dipping sauce) from my K-friends. It’s highly nutritious and have some medicinal value (libido enhancing) too. A word of caution though; it has been reported that some inexperienced eaters (mostly Koreans) have died of asphyxtiation (lack of oxygen) when eating this – mainly due to the live Octopus trying to escape while beeing swallowed in the throat and thereby blocking your windpipe.